Designed by a top Tenerife architect, Royal Hideaway Corales Resort is shaped like a boat and inspired by the island’s coral reefs. It’s modern and contemporary, providing stunning views over the Atlantic Ocean and the resort’s lush gardens. The resort is split into two parts, one is suitable for families and the other is exclusive for adults – perfect for couples looking for a relaxing getaway. Rooms are spacious, elegant, and boast beautiful ocean views. Guests will enjoy the open-concept bathrooms and luxurious rain shower, and can even opt for a suite with a hot tub on their own private terrace. 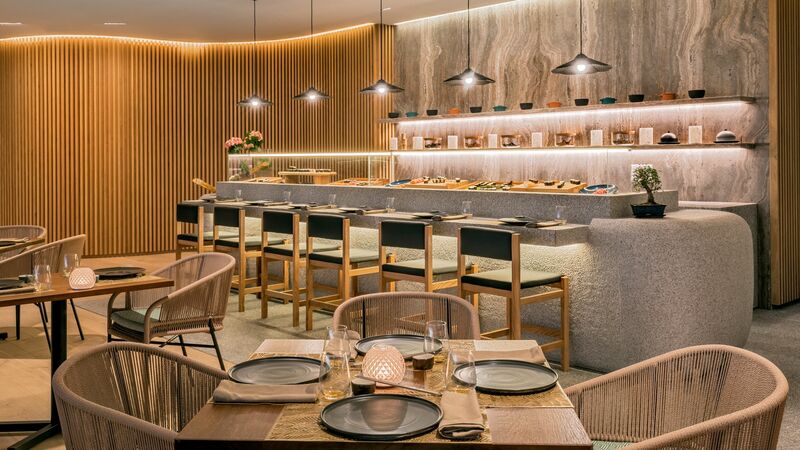 Take your pick from a range of dining experiences, including an international buffet restaurant, a Peruvian-Asian fusion, and a poolside grill. Those wanting to relax can head to the spa centre, where they’ll find a host of luxurious treatments and yoga and tai chi classes. Situated just 5–10 minutes from the black sandy beach of Playa de Enramada, Royal Hideaway Corales Resort is perfectly located. Take a stroll to the fishing village of La Caleta, where shops and restaurants are waiting to be enjoyed. This resort is comprised of two hotels – one is adults only and the other family friendly. Hotel child prices apply to guests aged 2–12 years. This hotel has 235 rooms. 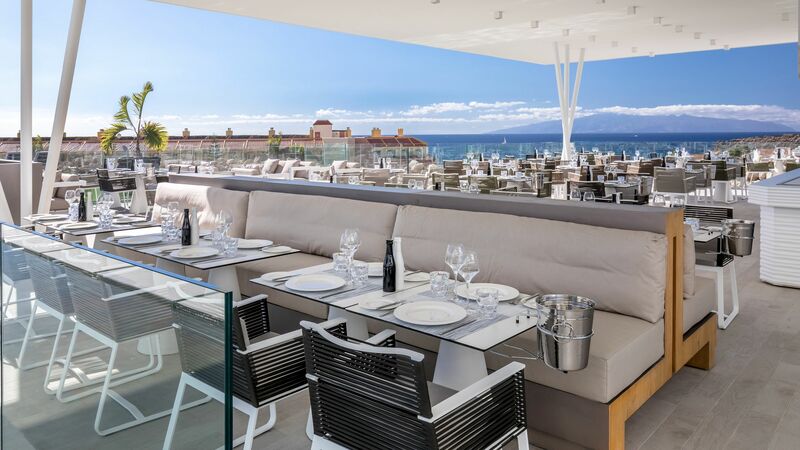 Situated by the rooftop pool of the adults only building, Corales Beach, this elegant restaurant provides a true gastronomic experience, created with local food by the Michelin-starred Padron brothers. Guests must be 16 or over to dine here, and gentlemen are required to wear long trousers and closed shoes. 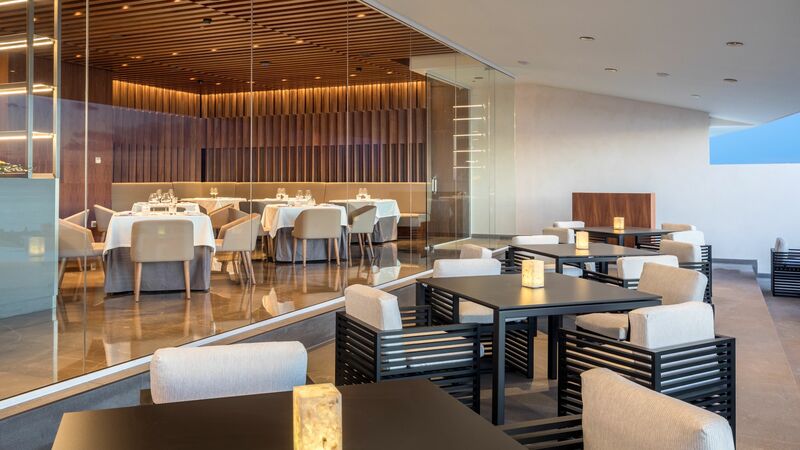 Located on the ground floor of Corales Suites, this a la carte restaurant offers an authentic Mediterranean italo cuisine, directed by Italian Chef Niki Pavanelli. Dress code is smart casual and previous booking at the hotel is recommended. Open: open for dinner (18:30 - 21:30) from Tuesdays to Saturdays. 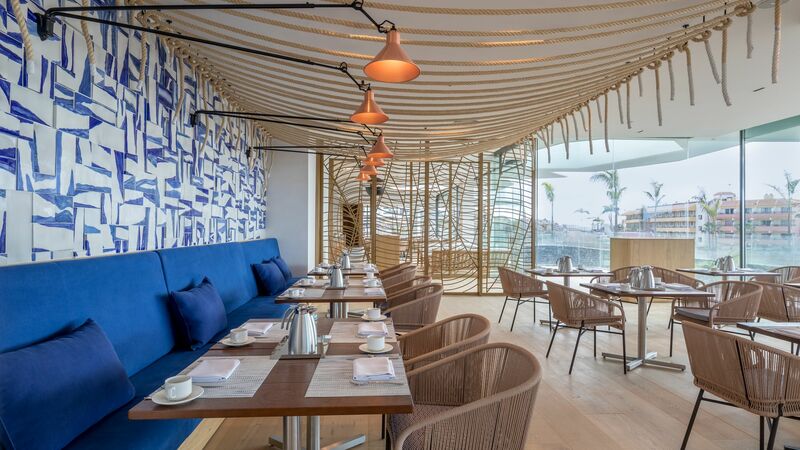 This á la carte restaurant at Corales Beach treats guests to an unusual but exquisite pairing of Asian and Peruvian cuisine. 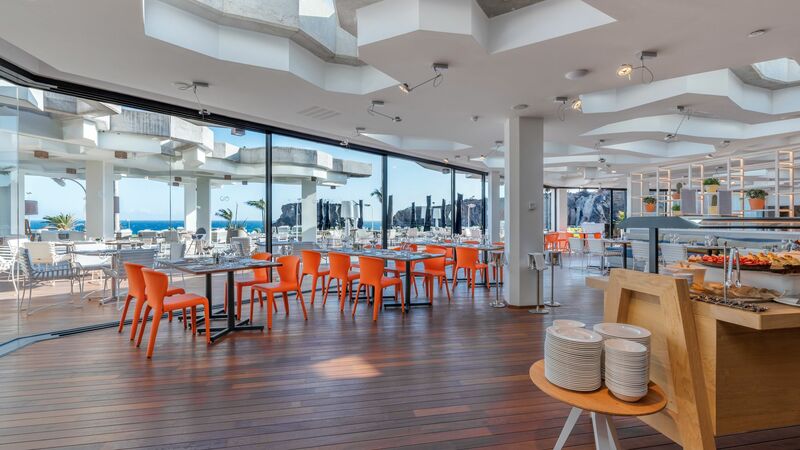 Head to Olivia Mediterranean Market for breakfast and dinner to enjoy a Mediterranean style buffet in a modern restaurant with luxury surroundings at the Corales Suites. Deluxe Suite guests can dine here. This Mediterranean a la carte restaurant at Corales Suites tempts with a wide selection of fresh seafood at lunch, and grilled meat dishes for dinner with a stunning sea view backdrop. This poolside bar is the perfect place to grab a drink or a light meal after a swim. 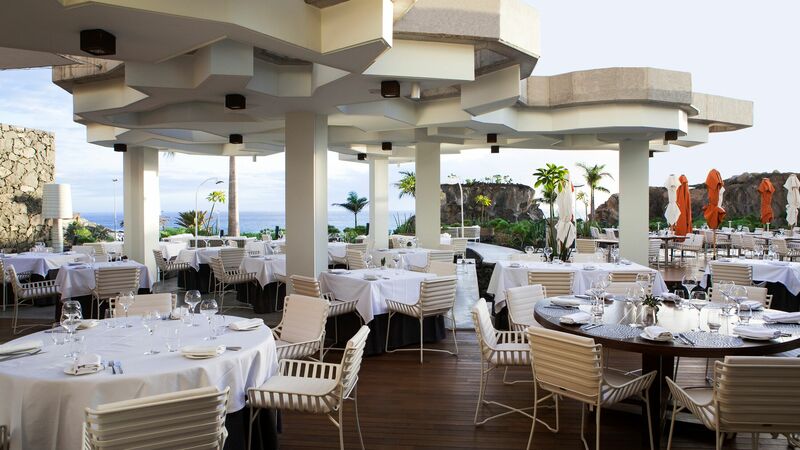 This buffet restaurant at Corales Beach showcases some of the best fish and seafood dishes in the Atlantic. Open: For breakfast and dinner. Also open during the day for drinks and snacks. Guests must be 16 or over to dine here. 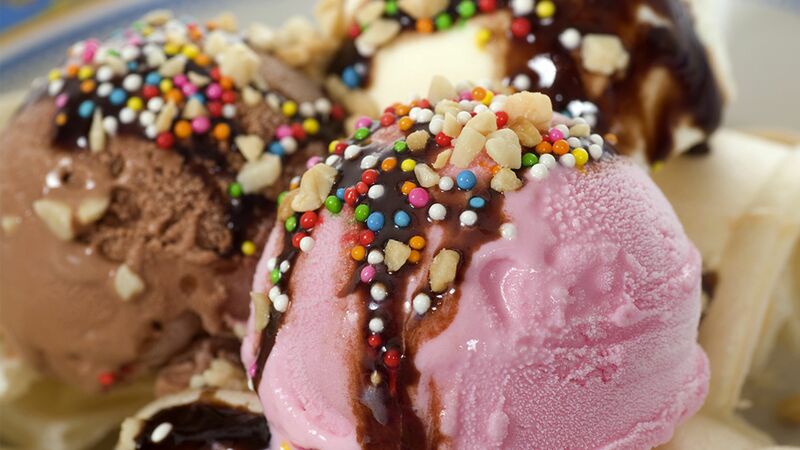 Guests can indulge in artisan Italian ice cream with a stunning ocean view at La Gelateria. 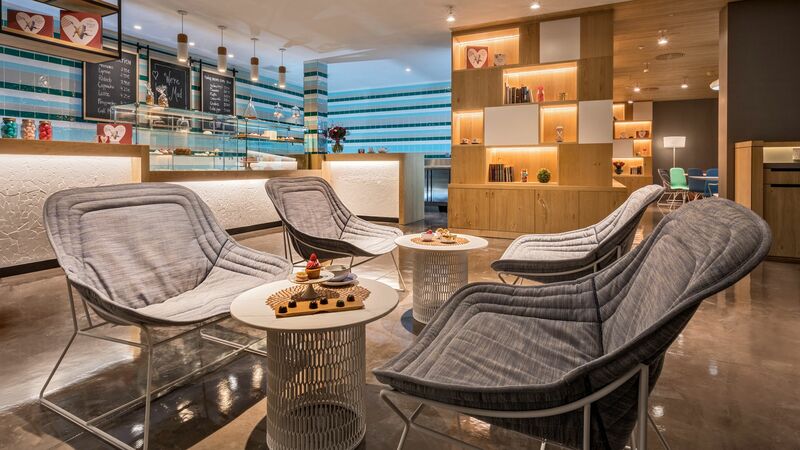 Guests can enjoy the tranquillity at this Lounge Library. On some evenings there might be an entertainment programme like a Canarian wine tastings, a Canarian cheese tastings or a Canarian local beer tastings. Take a dip in the family pool, or relax at one of two adult only pools, where you’ll find parasols and Balinese sun beds for the ultimate in relaxation. 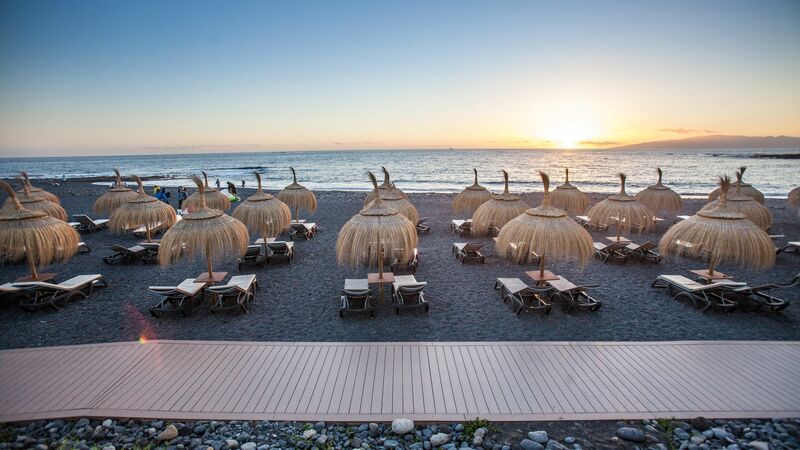 For those wanting to relax by the sea, take a 5–10 minute stroll to Playa de Enramada, where black volcanic sand and crystal waters are waiting. 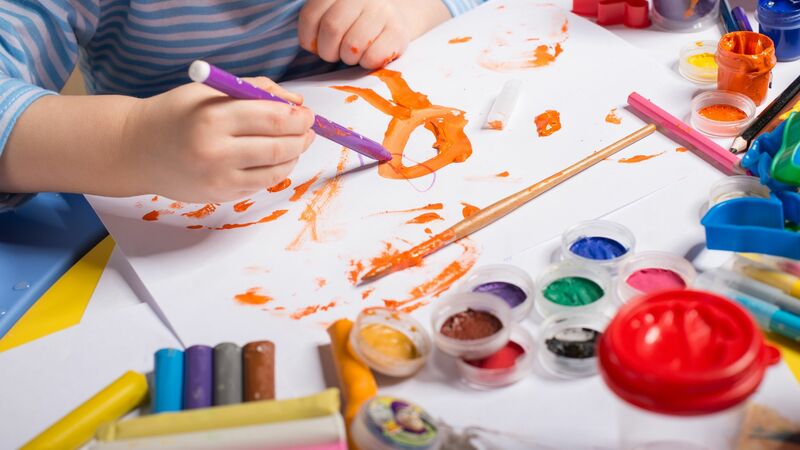 Children aged 4–12 can enjoy a range of activities at the Kids’ Club. Themed evening entertainment is also on offer every Tuesday, Friday and Saturday. Children under 4 can join the kids club under supervision. Guests are treated to a spa offering a range of luxurious treatments. Those wanting to stay active during their holidays can make use of the fitness centre. Guests can enjoy occasional light entertainment in the evening, including live music, shows and dancing. Royal Hideaway Corales Resort is located close to Costa Adeje’s beautiful coastline, with Costa Adeje Golf Course just minutes away. It’s ideal for nature lovers wanting to enjoy the beach or Tenerife’s unique volcanic landscapes, as well as being home to some fantastic opportunities to relax and unwind. 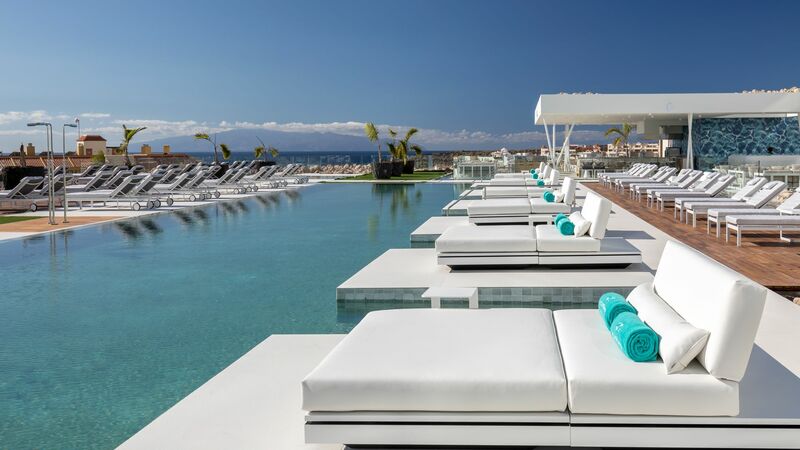 Luxury Costa Adeje has something for everyone. It has two stretches of beach backed by restaurants, bars and cafés and is home to water sports, spas, and more. There are designer shopping outlets throughout the town, as well as in the larger shopping centres, for adults to enjoy. Families will love the water parks, horse riding, playgrounds, and lots more. Royal Hideaway Corales Resort is a 20 minute drive from Tenerife South Airport. Junior Suites Front Sea View feature a spacious terrace as well as stunning sea front views as they are situated close to the water. Facilities include king size bed, complimentary Wi-Fi, smart TV, coffee machine, minibar, safe, bathrobe and slippers, hairdryer, bath and separate shower. These rooms are located in the adults only section of the resort. Junior Suites Front Sea View High Floor boast impressive ocean-front views, offering incredible sunsets from the comfort of your own terrace. Facilities include king size bed, complimentary Wi-Fi, smart TV, coffee machine, minibar, safe, bathrobe and slippers, hairdryer, bath and separate shower. These rooms are located in the adults only section of the resort. Junior Suites Front Sea View with Hot Tub offer very impressive ocean-front views. Outside, the spacious 20m² terrace features a private hot tub and incredible sunsets. Facilities include king size bed, complimentary Wi-Fi, smart TV, coffee machine, minibar, safe, bathrobe and slippers, hairdryer and separate shower. These rooms are located in the adults only section of the resort. Deluxe One Bedroom Suites Sea View boast a luxurious living room with a sofa bed, fully equipped kitchen, separate bedroom and a bathroom. There is a very large sun terrace overlooking the sea. Facilities include king size bed, complimentary Wi-Fi, smart TV, coffee machine, minibar, safe, bathrobe and slippers, hairdryer, bath and separate shower. Deluxe Two Bedroom Suites Front Sea View come with a fully equipped living room, kitchen, separate bedroom and a bathroom. 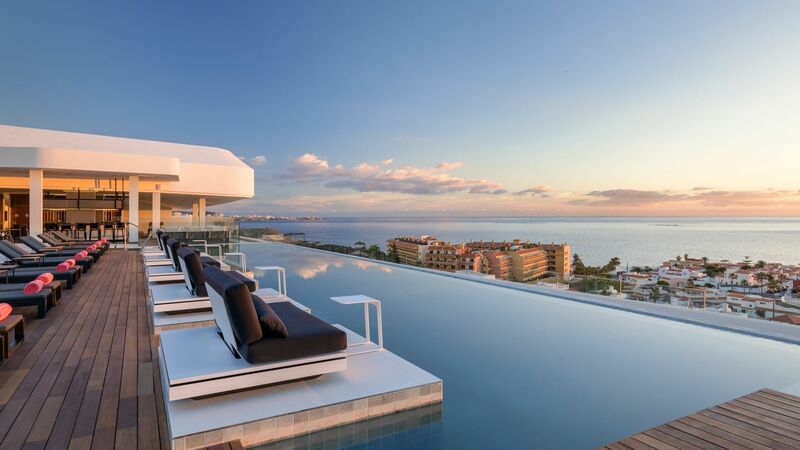 There are two fully furnished terraces, one as large as 50m². One overlooks the Atlantic Ocean whilst the other faces Mount Teide. Facilities include king size bed, complimentary Wi-Fi, smart TV, coffee machine, minibar, safe, bathrobe and slippers, hairdryer, bath and separate shower. Deluxe Two Bedroom Suites Sea View with Private Pool offer a fully equipped living room, kitchen, separate bedroom and a bathroom. There are two fully furnished terraces. Upon one of the terraces is a spectacular private heated saltwater swimming pool facing the ocean, whilst the other terrace looks up towards Mount Teide. Facilities include king size bed, complimentary Wi-Fi, smart TV, coffee machine, minibar, safe, bathrobe and slippers, hairdryer, bath and separate shower. Some suites overlook the main pool area. Save up to 15% on the hotel price for holidays between 11 - 30 April 2019 booked by 30 April 2019. This is an elegant luxury hotel in a lovely location. It is what the 5 star rating should represent - unlike many other hotels in this area. A relaxing, quality experience from the moment you arrive. Already planning our return. We've just returned from 8-nights at this hotel and it was pure luxury. The staff were all friendly and attentive (every one smiled and said Hola, from the housekeeping staff to the concierge and wait staff) and the rooms are among the best we've stayed in, with magnificent ocean views from the huge balcony, boasting dining table, chairs, sun lounges and outdoor sofa, in this architecturally-driven designer hotel. 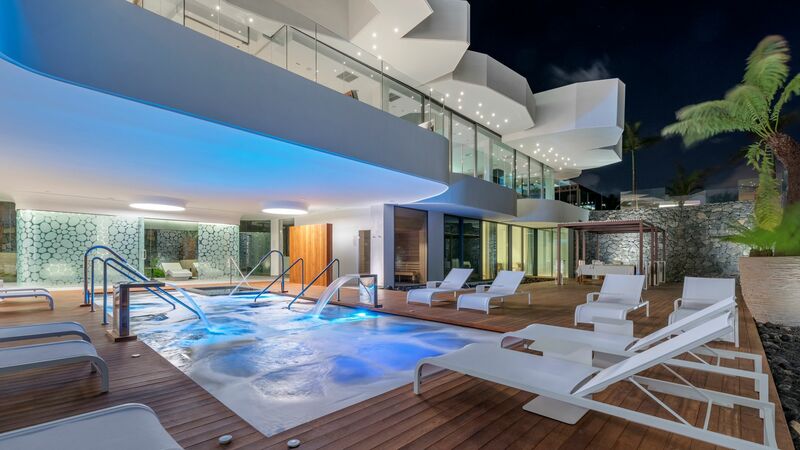 If you like sleek and contemporary, this is for you. Just wait until you see the lobby! The kitchens in the apartments are beautifully appointed, with top quality hob, oven, microwave, coffee maker, fridge, freezer, dish washer, washing machine, dryer, etc. We ate in the StarFish restaurant most lunches, with fresh fish galore, and the excellent Italian restaurant. The buffet breakfast offered such a wide choice and very good quality. The only small piece of constructive criticism is that the dinner buffet could be better or less expensive (it seemed overpriced for the offering, which was a real shame); I'm sure more guests would dine in, instead of walking into La Caleta in the evenings and dining at the pretty restaurants there by the sea. But on the whole, this place is pure heaven and we will definitely be returning next year. “ AMAZING HOTEL, STAFF, EVERYTHING IS 5 STAR !! Wow what a beautiful hotel, we where treated like we where their very first guests and welcomed with smiles from All the staff from the concierge, to the guys that take your luggage, from the receptionist, the management, basically every staff played a huge part to make our stay one of the best yet and we have stayed in a lot of hotels around the world 5 star, this hotel is right up on top of our list... Yes its a gorgeous, immaculate, spotless, huge hotel with everything that you need, they have thought of everything, from the lovely swimming pools, sunbeds, restaurants, gelato gorgeous icecream and i must mention the wonderful Ana on the icecream it was 7.40pm and she was tidying up as they closed at 7pm and we where craving icecream, and she said no problem and served us our icecream, nothing is ever a hassle or problem to the staff in this hotel. When we arrived at the hotel we where early, and because our room wasnt ready for about half an hour they offered to pay for our lunch for the 3 of us, but because we had just had our lunch we declined, so they said let us buy you coffee or icecream so we had that instead.. when we got to our room there was a bottle of champagne and a large bottle of water with an apology card for not having the room ready when we arrived, wow what a lovely gesture. I got a manicure and a pedicure and got my hair washed, blow dried and styled in the hotel hairdressers/beauticians and the girls where fantastic so welcoming and nothing was too much bother for us. We stayed in the 2 bedroom apartment and it was huge, 2 bedrooms, 2 bathrooms ( with complimentary toothbrushes/toothpaste, hair and body products, cotton buds/pads, shower cap, slippers and bathrobes, a huge balcony with sunbeds, sofa, chairs and a dining room table and chairs, a huge kitchen with everything you need in it, even a washing machine with washing tabs included and dryer, a dishwasher with the wash tabs also included, complimentary water everyday. sunbed towels also provided. My birthday was on the Monday and after being pampered at the hotel by my hubby i came into the room to a beautiful card and amazing dessert from the hotel, dont know how they knew it was my birthday but that was a lovely gesture.. :) Gym was brilliant we used this everyday and the staff where fantastic, complimentary water, cardio machines, weights, yoga etc The reason why i rate this 5 star is the Hotel is immaculate, provides us with everything we could possibly need, and i know if i needed something they would provide us as nothing was too much hassle, but what i truely loved the most was Every single member of staff where 5 star every single one made our stay even more special, the domestic staff where wonderful too, and so happy in their job, made us enjoy our stay important also, i cannot Thank you all enough for making our stay a memerable one you made our holiday even more special that we truely did not want to leave!!! Lovely Hotel with fantastic rooms and fantastic service. It would be nice to have a little more choice of restaurants under the half board programme but overall a really lovely hotel with some fantastic qualities.